Hunter has crafted a a thrilling adventure tale that stands ably among classic kids adventure tales by E Nesbit or Enid Blyton. They overcome the many obstacles posed by nature—bears, bees, bats, river crossings, cliff falls, impossible weather—but can they survive the treachery of their competitors? A rollicking adventure through the wilderness as the Santander children take on the race that their temporarily MIA mapmaking mother was meant to be tackling. 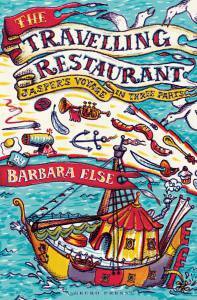 It’s a great read peppered with awesome illustrations. 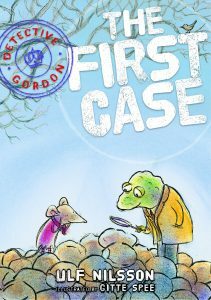 This is good old old-fashioned story-telling, a classic quest with challenges in every chapter, a well thought out narrative arc and plenty of in-jokes for all ages, ably supported with appealing illlustrations. This rip-roaring adventure about four kids and a parrot called Carrot is classic read-aloud fare. This book takes you straight into adventure. 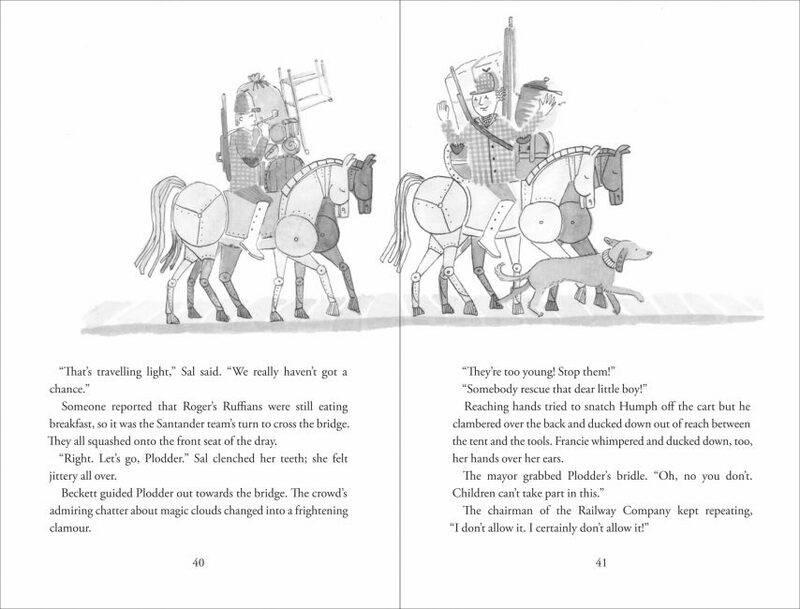 As the train pulls away and their mother is left behind, Sal, Joe, Francie and Humphrey rush towards The Mapmaker’s Race alone…The illustrations compliment the text well and I found it a great read aloud with chapters of a comfortable length. I loved this book and would recommend to adventure lovers of all ages. The world of The Mapmakers’ Race is magical enough to be intriguing but close enough to our own to keep the reader on firm ground. I loved this tale of ingenuity, exploration and nature. Lost in transit: One Mother. Missing in action: One father. I’s a classic formula in children’s fiction – think Swallows and Amazons, The Famous Five. This is an exciting adventure narrative with a real against-the-clock feel to it and a steam-age fantasy setting that fans of Vashti Hardy’s Brightstorm are likely to enjoy. Hints of steampunk and magic. 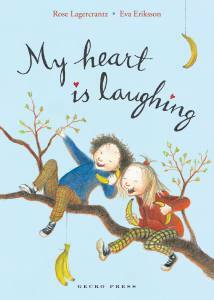 This sets it in good stead to entertain younger readers, and not seem too childish forothers. Strongly recommend. A thrilling and thoroughly enjoyable adventure full of setbacks and dangers and family squabbling, but also fun and laughter and the thrill of exploration and storytelling around campfires under the open stars. It is truly refreshing to read an adventure story of such quality and originality, pace and punch. Bookwagon is proud to recommend ‘The Mapmakers’ Race’ to its readers. Like all of these Gecko titles, The Mapmakers’ Race is a thing of beauty. This is a fast-paced and charming novel. It’s children are brave and competent but not always right. It’s world is magical enough to be intriguing but close enough to our own to keep the reader on firm ground. Can’t stop reading this. What a treat The Mapmakers’ Race by Eirlys Hunter is. The Mapmakers’ Race already feels like a timeless adventure. Its roaring spirit and dashes of fantasy are sure to inspire many children to take on their own intrepid journeys, but for now they’ll be more than happy to live vicariously through the Santanders, each of whom have their own strengths, and whose bond is heartwarming. 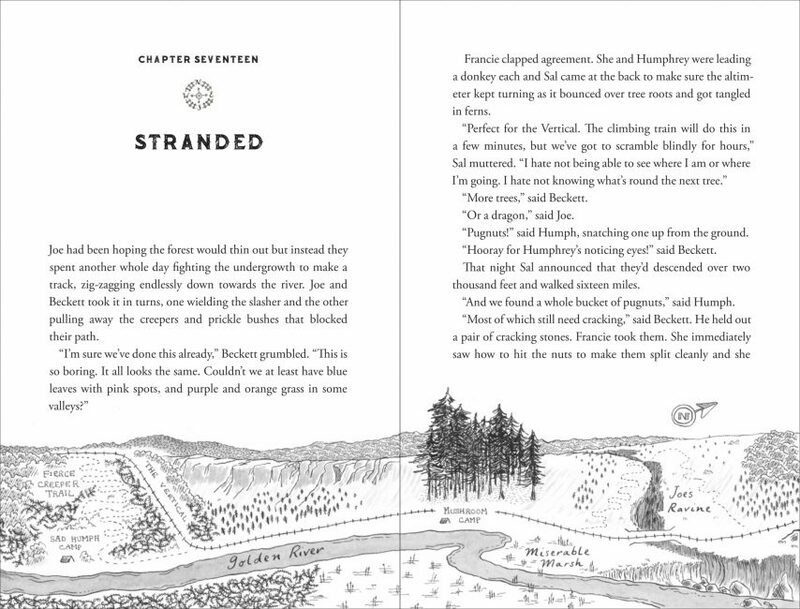 With Kirsten Slade’s illustrated maps guiding you through the chapters, Hunter has crafted a a thrilling adventure tale that stands ably among classic kids adventure tales by E Nesbit or Enid Blyton. It’s a glorious adventure story which readers will happily lose themselves in. For those who love journeys… this is a good read with beautiful illustrations throughout. I galloped through this book, finding it difficult to leave and I am hopeful of a sequel. There is, it seems to me, unfinished business. I’d whole-heartedly recommend this book to children who like a good adventure and compelling storytelling. “one of the most poised, stylish children’s books I’ve read in a long time … just an utter delight” Kate De Goldi, “I love this” Kim Hill. I picked it up, and I started reading it, and I couldn’t stop reading it… I have to mention it because it’s a cracker. Full of danger, excitement and adventure with wonderfully memorable characters, this is one not to be missed. The Mapmakers Race is an exciting credible well-paced adventure story. Very clever chapter structure ensures great tension throughout the book. One of those now hard-to-find junior fiction novels that have no parents in the action. The kids individually and as a group are so credibly drawn, I loved them all, their strengths and weaknesses. Lots of great celebrations of food! Read it in 2 sittings. I’m a mum and picked this book up to see if my 8 year old son might enjoy it, and I couldn’t put it down. Fabulously fun, exciting and adventurous but not a scary fantasy like so many kids books written lately. I loved the way the kids stuck together and grew in skills and daring – what a great message for us all! I deeply resented having to stop reading and cook dinner! Sal, Joe, Francie and Humphry lose their mother at the train station on their way to Grand Prospector to do the Mapmakers Race. The Mapmakers Race is a race to make a route from Grand Prospect to New CoalHaven with no food, no money and no parents to help! 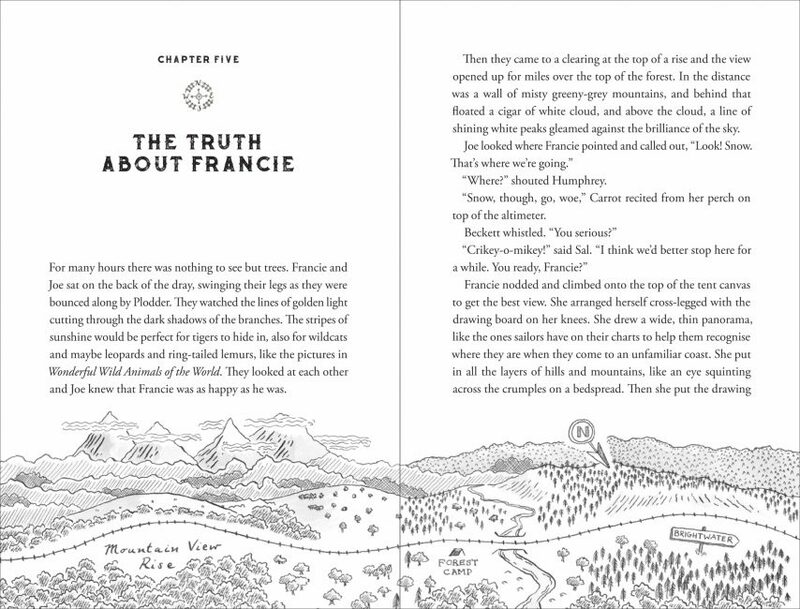 My favourite character is Francie because she has an amazing memory to retrace the team’s steps in here mind so she can draw the maps for her team. Francie and her team call this flying. 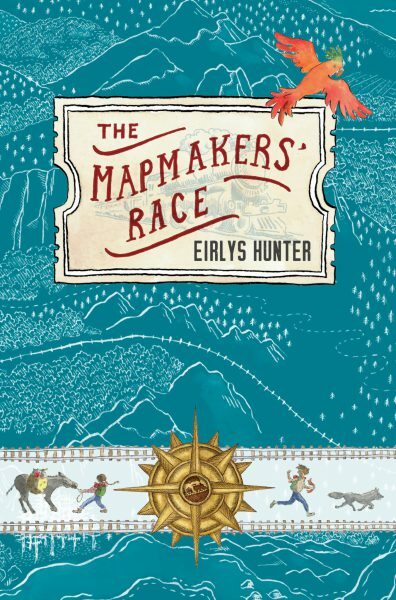 Erilys Hunter wrote The Mapmakers Race. She wrote the book very well because I liked how she described the characters by using descriptive language and I could imagine them in my head. The book was not what I expected because the cover page did not look like what I was expecting to read. It was a more exciting story! I would recommend this book to my friend Immy Pyne because she loves books about adventure and excitement. Started reading it, and I couldn’t stop… it’s a cracker. Within the first few pages I was hooked on this book! 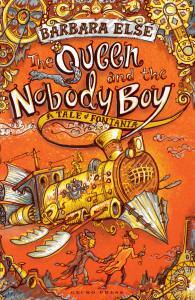 I love the storyline, the characters (especially Francie because she can ‘fly) and the Illustrations. I would totally recommend this book – It’s an awesome read. Imagine this. You’re waiting to get on the train to a very important event with your mother and siblings. You’re sent off to get some water, and when you come back, your sister tells you that your mother went to look for you, and you only have two minutes until the train leaves. And this train only runs weekly. So you are left with no adults, to do this event, the Mapmaker’s Race, alone. This is what happens to Sal, Joe, Francie, and Humphrey Santander in this exciting book by Eirlys Hunter. They participate in a race in which they must create maps for a track and a railway track. The Santanders desperately need the prize money to survive and find their missing father and are determined to either cross the finish line first, or win the prize for best maps. The Santanders and Beckett, their friend, are the only children competing and are looked down on by the others teams of adults. Will they make it across the finish line, and will they see their mother again? This book is funny, exhilarating, and it has a great storyline. I rate it 10/10 and recommend it for ages 8-12.